My number in Egypt is +2 016 3155176. Yes, apparently they use 016 in Egypt too. "I will follow you." This is a special update from your favourite uncle just to let you know that I'm thinking of you! who is your favourite adult girl? I miss my baby niece too!! This is a special update from HARD GAY just to let you know that I'm thinking of you! Ooookkk.. Whats with this OMG!!! Youre commenter number -inserts number here- thingy? Lol. Kenny, are you finally givin in and humorin us? First time being in the first 10 to comment, anyways, I am sure egypt is worth going..nice cute nephew you have btw..
8:53 AM, 7 April 2007 | Link | Reply copperhead! w00t in the top ten of commenters! SHE IS SURE HAPPY TO C U. 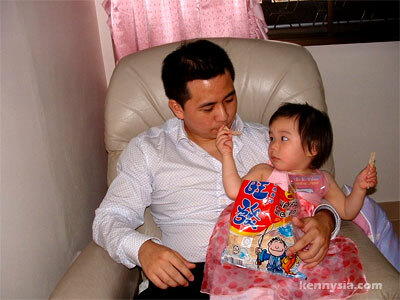 Just scroll down...the last few pages gotKenny Sia's trademark tummy! wah~ Egypt! cant wait to see more photos n post about it! Eygptian guy handsome not? hiak hiak! enjoy! that is like so adorable ! aaaaaaaaaaahhhhhhhh!!!!!!! sooooooo cuteeeeeeeeeee!!!!!!!!! kenny...ur niece is sooo much better looking than u!! wakakakakaka....must be the better genes!!! 12:00 PM, 7 April 2007 | Link | Reply crazymsianbabe!! Hahaha! Thank you Crazymsianbabe, because 'the better genes' come from me! ~~~ Kenny's sis! BTW, Kenny, next time when mum comes to NZ to visit us, pls buy some 'da fa' for Kirsten and me to eat! Heehee. her expression seems to read "AH!!! why got monster! take the snack! not my fingers please!" She's cute! 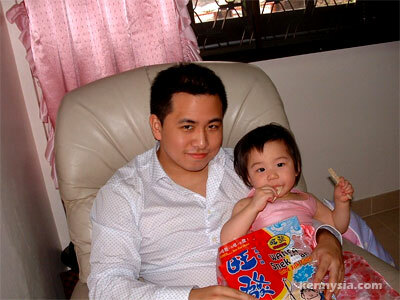 U r such a lovely uncle! What's that food? Taste good?